This changelog is moving to SAP Help Portal! Going forward, we’ll be announcing our new features, improvements, and fixes on SAP Help Portal at http://help.sap.com/cai instead of on this page. Look out for our What’s New on SAP Help Portal, as well as lots of other useful information. Why not head over now and check it out?! A new intent classification algorithm is now available that improves your bot's understanding and provides a better confidence score when an intent is detected. You can switch to the new algorithm in your bot's settings. If you switch to the new algorithm, you can't switch back to the old one. Since the new algorithm affects the confidence score, you may need to update the matching strictness in your bot's settings and adjust the confidence score threshold if you use the confidence score as a condition to determine which action is to be taken next. As of June 2019, this new algorithm will be applied to all bots, including existing bots. If you're the administrator of an organization, you can now assign one of the following permissions as the base permission to all members of the organization. You can also assign one of these permissions as an additional permission to a team consisting of one or more members of the organization. 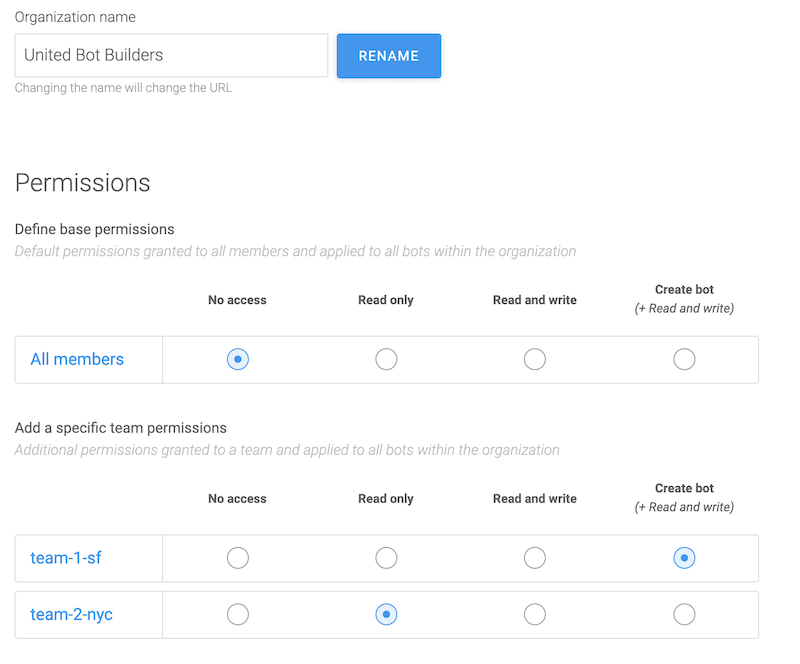 The base permission and team permissions are applied to all bots within the organization. When creating text messages or quick replies on the Actions tab or Requirements tab of a skill, you can now opt to use markdown to format text as bold, italics, or as a hyperlink. For a preview of how your text message or quick reply will be rendered, simply save it. When a user is conversing with your bot in English, French, or Spanish, and your bot replies with a list, carousel, quick replies, or buttons, the user can now refer to an item in the message using a superlative like cheapest or most expensive or using an ordinal like first or second. For example, if the bot displays a list of flights, the user can tell the bot to book the cheapest flight or to book the last flight. Under Preferences in your user settings, you can now set your time zone. This time zone is then used as the default time zone when you set filters in your log feed, usage metrics, and training analytics. When you create a new bot, the matching strictness in NLP is now set to 50 by default. You can adjust it in your bot's settings. You may remember that we mentioned in the changelog for the 1901 release that you'll be asked to confirm your email address when you next log in to SAP Conversational AI in order to continue to access the platform. If you've not confirmed your email address already, you must do so now. But don't worry, you only need to do this once! When a new product release is out, you're now alerted in your profile in SAP Conversational AI. From the alert, you can open this changelog in a new window and get the rundown on all the new features, improvements, and fixes. We've made a bunch of improvements to training analytics! For you to run a benchmark, your bot now only needs to have at least 4 intents. Previously, it needed to have at least 5. You can now filter your benchmarks by environment, version, language, and datetime. The new page design lets you run a new benchmark with or without a validation file more easily. The time-remaining information is now more precise. The Accuracy metric has been removed because it was the same metric as Recall. The following metric has been added when you compare two benchmarks: Size. When you click a single intent or entity in your benchmark, the same lines are now in focus in your confusion matrix. In your confusion matrix, the colors now more clearly show the percentage differences. Surely SAPconversationalAI will start publishing changelogs very soon.